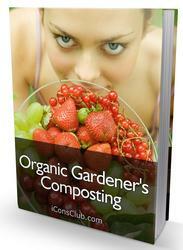 Anaerobic digesters are rectangular, cylindrical, or egg-shaped. Rectangular tanks, used in the past, are no longer used because of the difficulty in mixing the tank contents uniformly. Figure 5.10 shows simplified sketches of cylindrical and egg-shaped design. Egg-Shaped Type Figure 5.10 Anaerobic digester tank design. varying between 1 : 3 and 1 : 6. 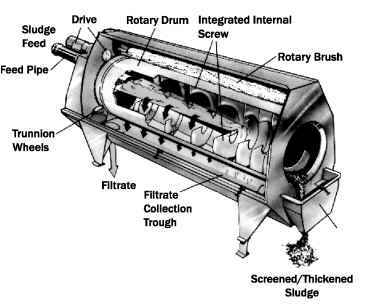 Digested sludge is withdrawn from the low point in the center of the tank. 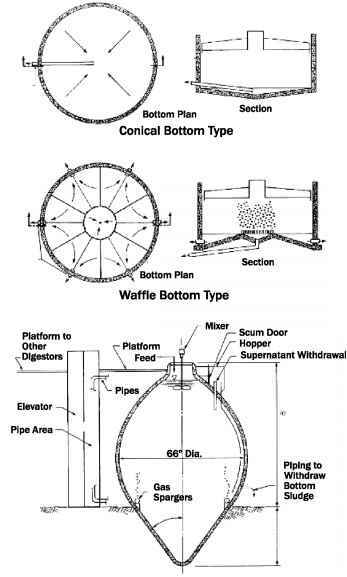 Some digesters have been designed with "waffle bottoms" as shown in Figure 5.10, to minimize grit accumulation and eliminate the need for cleaning. However, construction of waffle-bottom floors is more complex and costly. Egg-shaped digesters, originated in Germany over 50 years ago, are becoming popular in North America. The steeply sloped bottom of the tank eliminates grit accumulation; therefore, cleaning is not required. The liquid surface area at the top is small, so the scum accumulated there can be kept fluid with a mixer and removed through a scum door. Egg-shaped digesters can be built with steel or concrete. Steel construction is more common because concrete construction requires complex formwork and special construction techniques. The outer surface is always insulated and clad with aluminum for aesthetic purpose. Tanks are relatively tall. Digesters at the Deer Island plant in Boston, the largest system currently in operation, are over 40 m (130 ft) in height.